With all the work we do... to get animal housing finished; fencing installed, moved around, and secured; feeding and watering accomplished; hoofs trimmed and animals inspected; manure scooped and composted; garden boxes built, filled, and planted; lawns mowed, garden beds weeded, goats milked; eggs collected... and so on... around here adding another breed of critter might seem incongruous to our goal of simplifying our lives. And, if we were going to begin breeding, say peacocks, or parrots, or llamas, I would agree. But, let's talk turkey. Does THIS look like free range? 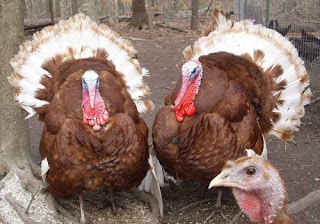 Our plan calls for us to buy and raise a small number (for breeding stock) of heritage turkeys much like how their wild counterparts live, minus the worry of predators and attack. Sean and I are planning on fencing off some of our lightly wooded land, (not currently in use between the goat pasture and raised garden beds) adding a out-building for shelter. First, we will rotate some goats to live there for a week or two to help clear out some of the brush undergrowth to open it up for pasturage to grow to this new area. Then, we will inspect the area to make sure it is suitable to our new additions later this summer. When our poults are fledged out and ready to be outside, they will move into their new home. We will not be eating our new turkeys. These, like all the other animals on our small and admittedly dysfunctional farm, will live out their days in peace and safety. But, they will earn their keep. 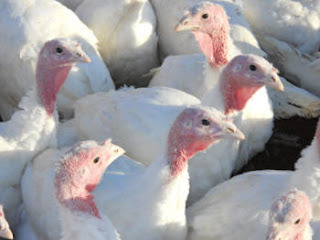 We will, collect their eggs and hatch batches of heritage turkey poults to sell to neighbors who want to raise their own turkeys to feed their families. 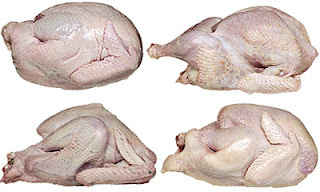 Heritage turkeys take longer (at 24-28 weeks) to grow to maturity, but every review I've read agrees they taste better and they are not treated with any of the chemicals or additives described above. Sean and I have thought it through, researched the benefits and costs in terms of time, care, and our ability. With all that in mind, our new breeding stock of six Heritage Bourbon Red Turkeys have been ordered from Muddy Hoof Farm in Lubec, Maine. According to our research, mature toms weigh about 30 pounds; hens, 12 to 14 pounds. The Bourbon Red is ranked No. 2 for taste. They are curious turkeys. Anything in their area is subject to close examination by them. They are calm, friendly and often underfoot during feeding time. They’re good sitters and mothers, but also tend to go broody early, so we'll need to keep an eye on that. We will be driving to pick up our guys from the farm on August 9th. I can't wait to meet our new guys and for this new adventure to begin. Turkey bird babies, I can't wait to see them!